It was my first five minutes of my first day of graduation studies at the Indian Institute of Technology. As the professor entered, all the students stood up out of respect, following the social etiquette we had grown up with. “Sit down please. Not IIT style,” quipped the professor. We sat—never to stand again to greet another professor for the next four years. When our class entered the fifth year of University, students from other Universities joined us for their post graduation. For them our “IIT style” was outlandish. And no professor bothering to educate them in the new style, they continued to stand and greet all professors, even as we old-timers sat with no qualms. But whenever our professor for structural engineering, Mr. Goyal walked in—even we stood with our new mates. It was not the professor but his enthusiasm that commanded our respect. Ever excited about his subject, he loved his service as a teacher. What to speak of becoming jaded, his enthusiasm rose with every successive class. He was a leader, and I learnt from him how enthusiasm for service can truly make a lot of difference to leadership. Enthusiasm, I saw, had the magnetic effect of pulling up even people ‘glued’ to their classroom seats for four long years. A leader’s enthusiasm for service should be electrifying. Without enthusiasm there is no life, what to speak of there being a leader. If the leader isn’t excited, how could he or she stir up excitement in the rest? Regarding enthusiasm, I was especially struck by a passage in Peter Burwash’s book The Key To Great Leadership: “It is easy to be enthusiastic when we are doing something for the first time. The real key to great leadership is to maintain that ‘first time’ enthusiasm when we are doing the same thing over and over again or when we have some trials and tribulations in our life.” This “real key” that Peter talks about remains elusive for most leaders. But leaders accomplished in spirituality are certainly exceptions. Spirituality invigorates our enthusiasm through what I call the “lever effect.” A little physical power wisely invested at an optimal point on the lever, a simple machine, could be used to move a massive rock. As a lever amplifies physical power, spirituality amplifies our enthusiasm to serve. A little enthusiasm wisely invested in meditation every morning, in time brings forth a resurgence of unlimited and sustained enthusiasm for selfless service—a long forgotten treasure of every soul, and the long sought-after ornament of every great leader. Yes! It’s time to introduce the lever effect in your life for thoughtful, prudent decision-making—today and everyday. Thank you Siddeshwar Prabhu. You shook me back to life with your enthusiastic article. The need of the hour is people with tremendous spiritual enthusiasm to save the world. The analogy of the lever effect is captivating and really hits the hammer on the head. A little booster dose of chanting in the morning and one is charged up for the day. Its true that for being a good leader, one needs to be genuinely humble & enthusiatic. Both these qualities are by-products of a genuine spirituality. I earnestly appreciate the wonderful qualities through which Radhanath Swami continues to inspire & enthuse so many people on path of spirituality. Very Nice & Inspiring Article, Anyone Who Read This Will Get Enthusiasm & Servitude For Progress On Spiritual Path Which Is Necessary To Achieve Ultimate Goal. Very powerful statements. Yes enthusiasm is the very soul to anything we take up and specially spirituality. Thank you for the realizations. it reminds me that whatever service I do, should be done with enthusiasm. The analogy of lever effect is very appealing. We need enthusiasm in every walk of our life. Excellent article bringing out how enthusiasm is important in leadership and how to develop the right kind of enthusiasm through practising spirituality. Thanks a lot for sharing. The articulate presentation of the sum and substance of spirituality to the specific audience is outstanding. Enthusiasm is required to be successful in one's life & it is the foremost thing required for one's spirituaul life. Radhnath swami has demonstrated this in his journey to seek God. A leader’s enthusiasm for service should be electrifying! We can see this in practical day-to-day life of HH Radhanath Swami! Thank you so much Radhanath Swamiji. Its nice to learn this one thing "The real key to great leadership is to maintain that ‘first time’ enthusiasm when we are doing the same thing over and over again"
Wonderful article. The analogy of the lever effect is perfect. That was a powerful lever effect! I loved the comparison of lever with our morning meditation. it is true "A little enthusiasm wisely invested in meditation every morning, in time brings forth a resurgence of unlimited and sustained enthusiasm for selfless service". Amazing how Radhanath Swami connects all aspects of one' life to God, and His teachings. Enthusiasm is required at every walk of life and we should aspire for enthusiasm for our spiritual progress. Very inspiring!Especially with the analogy of the lever effect. The Lever effect is too good! What an article! Short and riveting! It is interesting to see how spirituality and leadership are interlinked. Thank you for sharing this perspective. Enthusiasm is essential in every walk of life and it is certainly required for spiritual progress. Very nicely explained. "As a lever amplifies physical power, spirituality amplifies our enthusiasm to serve." Highly impressive statement and rest is followed automatically.Thank you very much for sharing this article. Thank you for sharing such valuable lessons on leadership through your own life examples….. By following in the footsteps of enthusiastic leaders like Radhanath Swami, we too can imbibe such qualities. Lever example is too good! Thanks for explaining the right context of enthusiam and leadership based on the principles provided by Radhanath swami. It is extremely difficult to remain enthusiatic and inspired always to do something. Please keep sharing such wornderful articles. Beautifully explained! Enthusiasm is what sustains one in any field he may undertake. Like Srila Prabhupada said " if you do not feel enthusiastic act so, then one will become enthusiastic". Radhanath Swami's enthusiasm when he conducts the annual yatras or organizes the various festivals and medical camps is the real success behind these events. The people associated with these get the energy from Radhanath Swami's enthusiasm. Thanks for wonderful article! Srila prabhupad, one of the greatest of the propounders of the Vedic culture throughout the world said that Surrender to the Lord is shown by the enthusiasm to serve. Morning meditation is really helping many in many fields. The spirit is the power from the supreme Person, Krishna which is the cause for all the causes. Very nice article. It is easy to be enthusiastic when we are doing something for the first time. The real key to great leadership is to maintain that ‘first time’ enthusiasm when we are doing the same thing over and over again or when we have some trials and tribulations in our life. The power of enthusiasm applied to meditation will work wonders! Thanks to the author for this nice article. 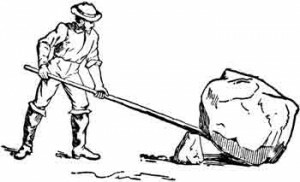 Yes,this lever is very much needed to life the rocks in our own lives. They can be of unwanted things which hinder our progress on the path to success. The rocks of bad habits , mentalities etc. Thank you very much for this article. Thank you Siddeshwar for you much insightful article on Meditation..
A leader’s enthusiasm for service should be electrifying. Without enthusiasm there is no life, what to speak of there being a leader. If the leader isn’t excited, how could he or she stir up excitement in the rest?.Amazing. Thank you Siddeshwar for an electrifying article reflecting radhanath swami's mood. Thank you for sharing this nice article. Enthusiasm is really important in every action of our life especially in our spiritual life. Enthusiasm coupled with leadership is far more beneficial than lethargy and leadership, which causes detrimental effects and lack of hope for the followers. Making the necessary changes for a better Tomorrow resonates with being and living in the present – making the most of NOW. Great article! A profound explanation of the ‘lever effect’ – very well-written for a practical application in our lives. I read this article for the 3rd time and i still like reading it again and again! It is one of the best articles i’ve read on this topic.